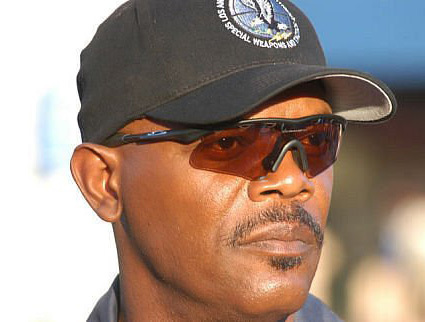 Samuel L. Jackson wears Oakley M Frame Hybrid sunglasses in the movie S.W.A.T. 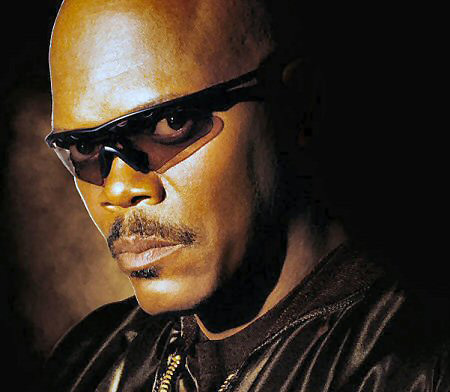 Samuel L. Jackson wearing Oakley M Frame Hybrid sunglasses in S.W.A.T. The other S.W.A.T. members in the movie (played by LL Cool J, Colin Farrell and Michelle Rodriguez), are wearing Oakley M Frame with clear lenses. Samuel L. Jackson's glasses in the film have what looks like red VR28 lenses, but this model is available in several different color, lens and frame combinations. The Oakley M Frame is available on the official Oakley website, where you also can customize your M Frame sunglasses to this exact combination. The M Frame is worn by real-life S.W.A.T. teams and sports legends like Lance Armstrong, Natascha Badmann, Tony Gwynn and Brian Lara. The frame comes in a standard version, and the special, flexible, hingeless Pro M Frame. Each M Frame style has removable, interchangeable lens options that allow you to adapt instantly to any light condition. Five lens shapes are designed to match the M Frame and Pro M Frame.